The Water & Environmental Technology (WET) Center is a model for capacity building and collaboration among academia, government, and industry. The Center conducts cutting edge research directed by the Industrial Advisory Board members, who share the results of the research, including intellectual property rights. The Center’s “technology roadmap” is focused on emerging and conventional contaminants, wastewater, drinking water, and water resources, including water reuse. Under the overall purview of the National Science Foundation, the Center demonstrates how research focused on current and emerging challenges can result in real-world commercial solutions that can help people and communities. As an example, one of the member companies recently commercialized a treatment technology for per- and polyfluoroalkyl substances (PFAS) resulting from Center research. This technology will help communities address PFAS contamination in drinking water sources. 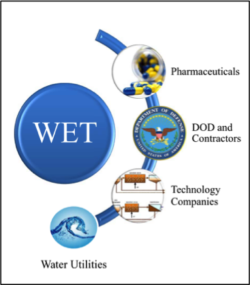 What is the Water & Environmental Technology (WET) Center? The WET Center is an “Industry and University Cooperative Research Program” under the purview of the National Science Foundation. The Center was established in 2009 at Temple University, with subsequent partner sites at the University of Arizona and Arizona State University. The WET Center develops innovative methods and technologies to protect water quality by detecting, assessing, and treating conventional and emerging contaminants (ECs). The WET Center works with industrial partners to ensure the work is relevant to industry and the environmental issues they are addressing. What is the function of the Industrial Advisory Board? All members serve on the Industrial Advisory Board (IAB), which is critical to the success of the Center. The IAB members assist in research direction and review progress. IAB members include companies in such sectors as treatment technologies, contaminated site cleanup, personal care products and pharmaceuticals. Other members include the Department of Defense and a number of water and wastewater sanitation districts. Two program reviews are held for IAB members each year; one review is held in Pennsylvania and one review is held in Arizona. What kind of research is performed? The Center focuses on industry-relevant, pre-competitive research. IAB members collaboratively developed a “technology roadmap” to steer research efforts. The overarching concept is to have the tools to understand an entire problem, from detection to successful treatment. Efforts can generally be grouped into three research thrusts: Analytical Technologies, Risk Assessment, and Treatment Technologies. A detailed topic list is shown below. The WET Center uses state of the art laboratories. Those familiar with sampling and laboratory testing will understand the following abbreviations for the Center’s analytical capabilities which include UPLC/PDA/QToF/, UPLC/MS/MS, GC/MS/MS, GC/MS-P&T, Iron Chromatograph, and PCR analysis. The WET Center has both bench and pilot scale treatment labs. Bench scale instrumentation includes flow through and column tests, batch reactors and a Collimnated Beam Device. The Pilot Scale testing labs include all of the technologies listed above. There is seamless integration between the three laboratories; creating project efficiency and continuity. IAB members help identify industry relevant research and share the intellectual property. In accordance with the Bayh-Dole Act, member companies receive a non-exclusive, royalty-free, non-transferable license to use and commercialize intellectual property that emerges from the work of the Center during the time of their membership. One of the IAB members has commercialized a treatment technology resulting from Center research for PFAS. Another treatment technology is in the development stage and is the subject of a proposed pilot project at a DoD installation. Collaboration pays dividends; the return on research investments for members is high because costs are leveraged and shared by all members. Additionally, the Center has low overhead and much of the research is done by affordable graduate and post-doctorate students under the supervision of university professors. IAB members can get access to state-of-the-art laboratory facilities, opportunities for confidential research and outstanding networking and collaboration opportunities. Regarding capacity building, the Center also provides the opportunity to engage with student researchers and help train the next generation of scientists and engineers. Some of the IAB member companies have hired the Center’s post-doctorate students after project completion, thus providing a pipeline for talent. For further information, please contact the author at the address below. Note: Mr. Yaroschak previously served as Director, Environmental Compliance & Restoration Policy in the Office of the Assistant Secretary of the Navy (Installations & Environment). Most recently, he served as the Deputy for Chemical & Material Risk Management within the Office of the Secretary of Defense. He is currently President of Sustainable Methods, LLC and THG Senior Advisor for Sustainability, Site Cleanup, and Chemical Risk Management. He also serves as an advisor to the WET Center. He can be reached at SMethods@outlook.com.